FINALLY! You should all know by now that the International Makeup Artist Trade Show is the absolute highlight of my year. After some bittersweet news last year, that the dates for LA and London would be swapped around and that we’d have to endure an extra 7 months of waiting until our next show, I can at last begin my countdown to IMATS London 2013! You don’t know how excited I am. In exactly 2 months’ time, I will be thoroughly battering my bank balance with my girls Kim and Bicky, who are both taking up camp at Chez Do Not Refreeze for the duration. It promises to be a girly weekend of epic proportions, and I am having serious trouble exercising the required level of patience. I really look forward to seeing IMATS London 2013 taking place at a new venue – the Olympia National Hall in Kensington. It’s just as far across London for me as Alexandra Palace is, but it’ll be nice to have a change of scenery. It’ll also be a real treat to be leaving the house in daylight hours (I’m always up and out by 6.45am on IMATS days!) and not having to wear a million layers which become a pain to lug around when the venue inevitably gets hot. Assuming this June is a little less rainy than last, I’ll be dressing lightly to attend for once! Whilst I don’t think the exhibitor list is totally filled yet, here’s some that I look forward to visiting. Brushes are always a must to stock up on at the show. It’s pretty much the only time of year that I buy brushes. I only own one brush by Bdellium Tools, but I like it a lot so will be taking a look at some of their others this year. Crown Brush and Royal & Langnickel are favourites of mine for absolute bargains with serious quality – but visit them early to avoid stampede-like crowds. I don’t doubt that I’ll spend a disproportionate amount of time drooling over the uber-expensive brushes at Hakuhodo – but I’m not holding out too much hope for any discounting on their part, as historically they’ve never offered any. Charles Fox is always a favourite of mine, both their store in Covent Garden and their ever-awesome pitches at IMATS. This is the place to go for Kryolan, and I never pass up on the opportunity to grab the most recent issues of Make Up International magazine from them which is such a good read. Inglot is another must-see; they make my favourite eyeshadows of ALL TIME (not even joking) but pay them a visit as early in the day as you can as it becomes difficult to squeeze in very, very quickly! I love me some Make Up For Ever, so they are naturally high on my hit-list. Their products are also stocked at the pitches of PAM and Guru Makeup Emporium, so whoever offers the biggest discount will win out in that respect. It’s usually about 35% across the board, but we’ll see! If I’m feeling theatrical (which I undoubtedly will be with all the inspirational creations at the show), I’ll pop by Treasure House of Makeup for some Ben Nye goodies, and pay a visit to Mehron too – they’ve got some water-activated stuff I’m dying to check out. Love Makeup will be worth a visit for the huge variety of stock that they carry. If you’re after some OCC Lip Tars but their own pitch is a little crowded, Love Makeup will be the place to go. I’m disappointed to see that once again Sugarpill won’t be making their way to the UK to exhibit at IMATS London 2013 (seriously guys, please come one year! ), but again their products are stocked by Love Makeup so keep an eye out. I also notice that Real Techniques aren’t on the exhibitor list like they were last year – hopefully they’re still to be added, but if not once again Love Makeup can sort you out there. I’ll pay a visit to the NYX booth, but this will only really be to make a shopping list – I love this brand but even with a trade show discount, the prices in the UK are way more than what you’d pay to buy these and get them shipped from the US. One thing I am determined to pick up this year (depending on the funds situation of course!) is the Ivory pigment stack from Naked Cosmetics. I lust over this every year without fail, but never pick it up. As a huge long-time fan of xSparkage, who uses these duochrome pigments in almost every video, I know I need this in my life. It’s only a matter of time, surely! Try as I might, I’m just not really a fan of MAC – but if you are, they’ll be worth a visit for the Pro products that you can’t easily get hold of but beware of big crowds. I haven’t seen NARS exhibiting at IMATS before so that’s a new one, but it’ll be good to check them out as they’re a brand I’ve never really paid any attention to. So, there’s what I’m most looking forward to from the current exhibitor list. I’m hoping there’s more to be added as I feel there’s some gaps to be filled! 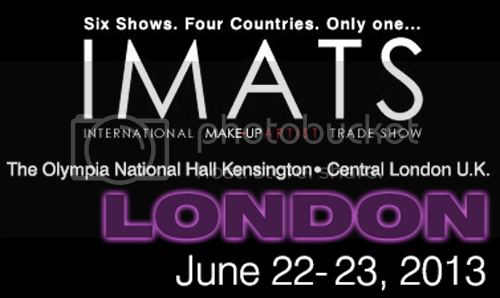 Keep an eye out – in a month’s time my IMATS London 2013 Countdown will continue with a look at some of the must-see talks and demonstrations. DIS MADE ME SO EXCITED! You are so lucky!! I wish I could be there, but I live in Spain :__( plus the 23th of June is my birthday xD.